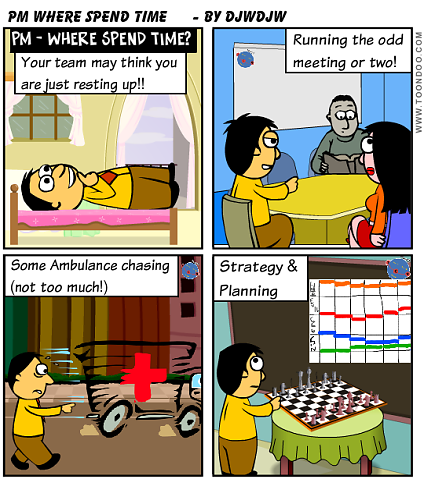 How should a Project Manager spend his/her time? Where should a Project Manager spend his/her time? First and foremost you need to be good at self time management as, despite what the team may think, you can normally fill your day a number of times over. This post cover my thoughts on where you should spend your time. Let us start with what isn't your priority - that is doing "technical" work within the plan. By all means lend a land if you can offer some help on technical activities but this should be ancillary to your main role as Project Manager. 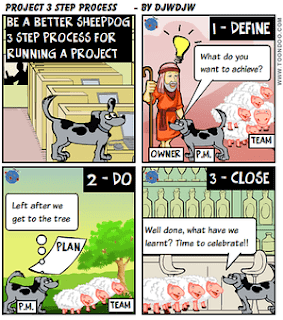 There is an old saying that if the plan has the Project Manager scheduled on the critical path, it is going to slip (or quality will suffer) as ensuring other activities are on track will suffer. keep a watchful eye on Risk Management activities and the status of Risks because people can easily ignore this and as I always say, Attack the Risks before the Risks Attack you! I recommend getting out of your seat and doing a bit of wandering and chatting (or have a chat when you bump into folk). Showing your face to the team is good, showing interest in people is good and it is amazing what you find out by such an approach. Hopefully you can mix work and pleasure a little - learning a bit more about your team mates in an informal way can aid bonding as a team (read this post for more on the human side of teams). Of course MBWA is somewhat tricky when you have teams spread geographically. In such circumstances, you have to work particularly hard when you are face to face so that you can continue to dialogue (informally as well as formally) when remote. So MBWA is useful but you will still need your formal update meetings with team leads etc which enable a structured approach to updates from the team to you and from you to the team. Get these scheduled as regular meetings in the calendar. Have a read of various posts on Monitoring & Control such as this one. You need to spend some time each week looking ahead on the plan (and then reminding the team as necessary). Due to Planner's Droop there is likely to detailed planning to be undertaken from time to time and you need to ensure that there no blockers which might cause a delay moving into the next key part of the plan. Daily Prayers meetings are useful for focusing team members on what needs to be achieved in the particular day. These can be useful at any stage in the project lifecycle but I will certainly use them if things are tight and you need special focus to get across the line. The form of the meeting is a short session with a team (maybe people standing to focus on short communication) where you go round everyone briefly discussing if necessary but more importantly, gaining commitment for what each team member will achieve in that day. If someone raises a blocker then you may need to discuss briefly or take offline to keep the meeting crisp, ideally 15 minutes maximum. As a Project Manager you will have pressures on your time and need good time management skills to ensure that you cover a number of key activities within each week of the Project. So stop and think about what you have spent time so far in the week and what you still need to achieve in the remainder and react accordingly. If I was to leave you with one thought it is to spend your time on things which have the highest probability of tripping up the plan, not on things that you like doing or find easy! !